Guitar tuners now come in many guises, from clip-on devices, plug-ins and phone apps to pedals and rackmount offerings. TC Electronic’s PolyTune was the first polyphonic guitar tuner pedal however, and provided at-a-glance confirmation that each of the six strings were in tune — or weren’t! A half-width mini version (with no battery-power option) followed, but both designs have since been updated, to provide better visibility and enhanced features. Available in black or white, and built into a tough metal case, these latest PolyTunes have a much brighter display that adapts more effectively to the ambient light level, and it can be set to tune either guitar or bass. As before, it accommodates alternative drop-D and capo tunings, but this time around you can also choose needle or strobe display modes. A mini USB port allows firmware updates to be loaded from a computer. As before, a true-bypass switch mutes the output while tuning, but there have been numerous internal improvements that aren’t immediately evident to the user. 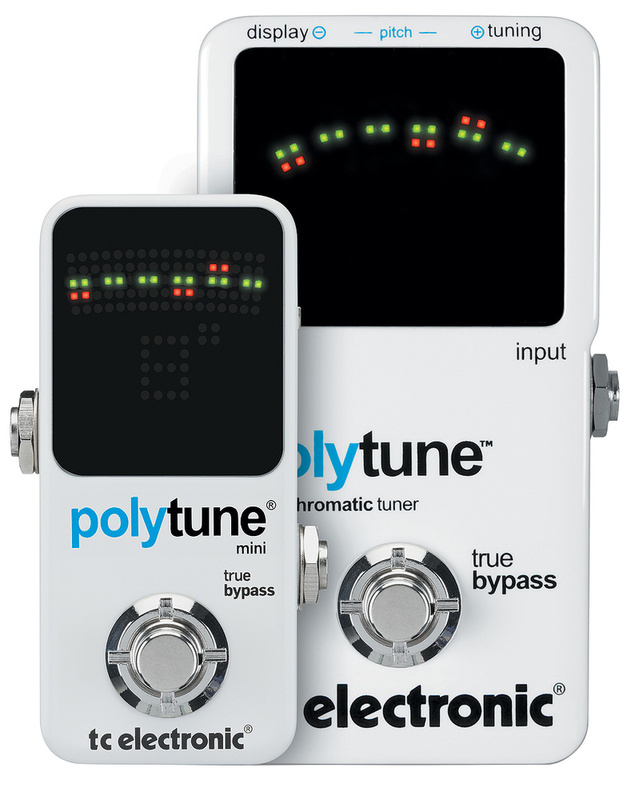 If you pick one note at a time, the new PolyTune 2 devices function as standard chromatic tuners. Play multiple strings, however, and they’ll flip to polyphonic mode, with green LEDs lighting up when the guitar is in tune, and a pair of red LEDs above and below each one indicating sharp or flat respectively. A newly added Display button steps through the four options of guitar or bass and needle or strobe tuning. The needle mode adopts a familiar pointer, while strobe mode provides a display that drifts to the left if the note is flat, and to the right if sharp. As you get closer to the correct pitch the strobe slows, stopping when you are in tune, at which point a couple of arrowheads also appear. The needle mode’s 0.5 cents accuracy is good enough for most purposes, but the strobe mode is accurate to 0.1 cents, which rivals that of the high-end tuners used in guitar workshops. To reset the tuner to drop-D tuning, in which the low E string is tuned down to D, you need to press and hold the footswitch for about three seconds. Pressing and holding the footswitch again restores normal tuning. To set capo tunings, the small Tuning button on the side of the tuner case is used to step through the options, which go as low as tuning the E-string down to B or up as far as the B above, all in semitone steps. The reference pitch can also be changed from the standard A=440Hz by using the Tuning and Display buttons in combination. User settings are stored after powering down. The manual suggests selecting the guitar’s neck pickup and using the thumb to strum the strings while tuning, but on my Strat I found it pretty solid on any pickup setting playing with a finger or a pick. I found the display much brighter and easier to read than in the earlier versions, and although the Mini requires external power, it has the same ubiquitous connector and voltage requirements as Boss pedals. PolyTune 2 Mini £60, PolyTune 2 £68. Prices include VAT. PolyTune 2 Mini $89.99, PolyTune 2 $99.99.